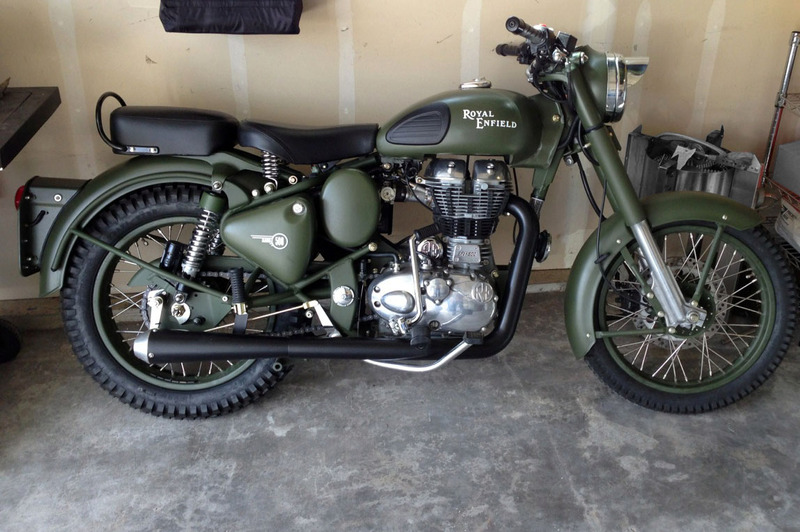 Battle Green Royal Enfield C5 looks ready to serve. "I have been working on a 2011 Military for a couple years now in between military deployments (I'm a Navy pilot in Washington state). 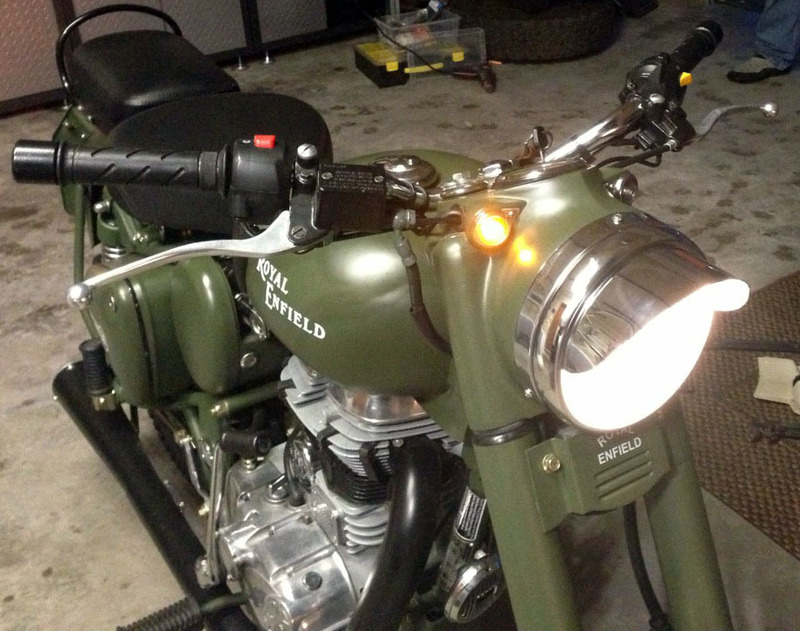 "I've turned the pilot lights into turn signals, and added turn signals on the back plate, for a low profile look. Button turn signals at the rear clean up the look. 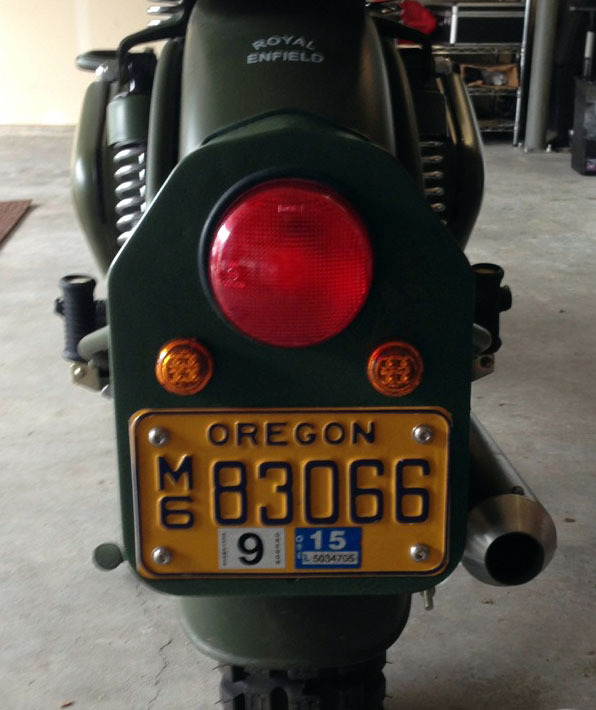 "I replaced the tail light with an LED and the pilot lights as well. I tried and tried to find amber lights that size in halogen, as I'm not a huge fan of LEDs on the older rigs. However that was pretty much my only option for the look I desired. "I got them on there and I must say I love them; I don't think they take away from the old school appeal of the bike at all. Just waiting on my amber pilot light lenses from India to complete the front blinker set up. Signaling for a turn with the pilot lights. 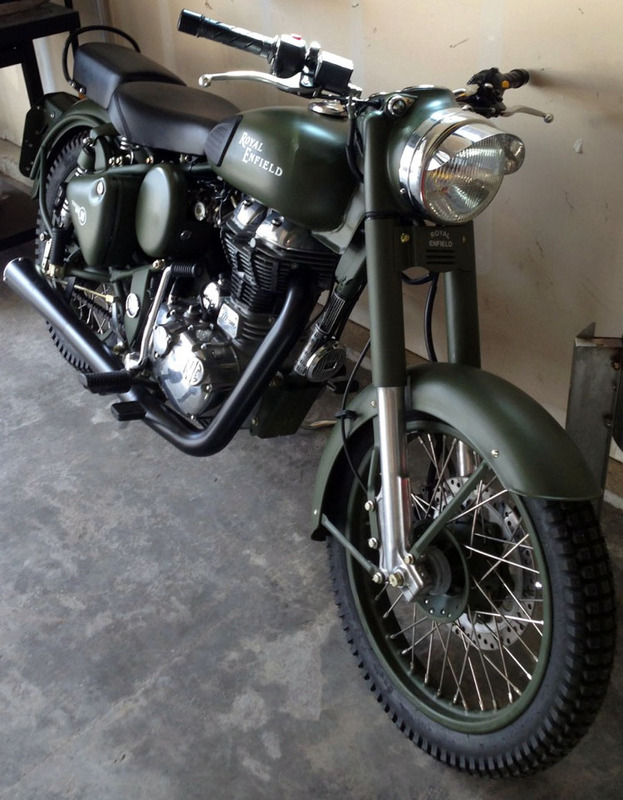 "Then just normal stuff: D&D exhaust, 7-inch headlight, pillion seat, and some trials tires to round out the look! "The handling is fine with the tires. No marked difference. I do want to put a bigger tire up front now as that rear tire dwarfs the front (4.0 vs 3.0)! In time, I will put a 3.5 of the same tire up there. "I am flying EA-18 Growlers (Super Hornet variant) out of Whidbey Island right now. Up until last year was on the EA-6B — a very old school jet from the Vietnam era; flew that on and off the USS Enterprise for two deployments. I love the classics!" What exhaust system is that? Derek, did you eventually get your equal size tire on the front? I'm using the same tires, and will clearly need longer fender stays. Where did or will you find the replacement b5 stays? I have not put a bigger tire on the front... but nfield gear said they have the b5 stays if you need them. Where did you get the LED rear directional bolts? What are the size of the tires used ! Please tell me.